Whenever you drive around and that unfortunate spot of rain begins to fall, what do people in convertibles do? Well, any average person would rush to pull over, and make sure that they get the roof up in time. There’s also another method that may interest you in the mission to keep yourself dry…simply drive faster. That can’t possibly work, right? You’d certainly be surprised! To answer the question in its most basic form; yes you can. If you are able to reach a certain speed (and stay above it), you can get through almost any harsh, downpour in almost any car! It’s all about the aerodynamics of these cars, which allow you to avoid getting all wet and ruining your car’s interior. There are a number of different pathways that air takes as it passes over or through your car. These can be referred to as boundary layers and to further figure out how this comes into play, we need to look at said pathways. 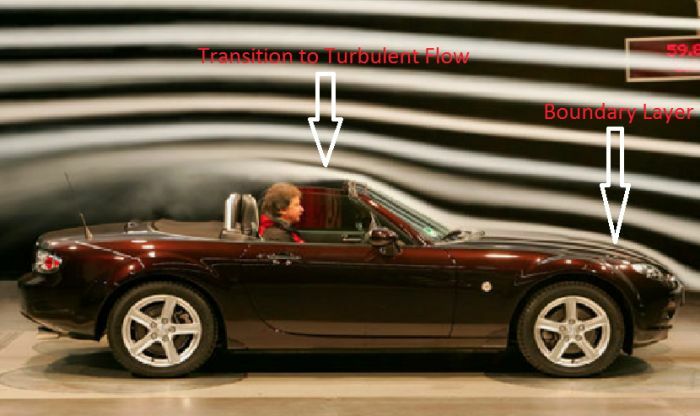 The two types of generic airflow prevalent in these conditions are laminar and turbulent, with lamina consisting of high pressure, fast speed, swirling air/wind), and turbulent consisting of the transition from laminar into turbulent. In other words, when laminar airflow begins to thicken at these boundary areas, enlarging the possible area to keep dry.